9 days tour with highlights of Vietnam, Cambodia and Laos will bring you to very beautiful places in these country. Start from Hanoi – the city for peace where European architecture exists harmoniously with the local buildings and structures. Continue with beautiful Halong bay before coming to Angkor Complex (Siem Reap – Cambodia) and finish in Luang Prabang – the heart of Laotian culture. Upon arrival, you will be welcomed by tour guide and driver of S Vietnam Travel. Tour briefing and transfer to your hotel. Enjoy walking tour around Hoan Kiem lake and the Old Quarter of Hanoi. In the evening, have a welcome dinner at the local restaurant hosted by S Vietnam Travel. Having breakfast at hotel then start a guided city tour of Hanoi. Having celebrated its 1000- year anniversary in 2010, the city has a rich and fascinating history. Your city tour will take you to the main attractions of Hanoi, including Ho Chi Minh complex (Ho Chi Minh’s mausoleum and stilt house); the Presidential Palace, the nearby One Pillar Pagoda, the Temple of Literature, West lake, Tran Quoc pagoda, Quan Thanh temple and of the city’s museum (History Museum or Ethnology Museum). Late afternoon, enjoy Water puppet show - one of Vietnamese traditional performance. Enjoy an early morning swim (during the summer), followed by breakfast as you cruise through more spectacular scenery. The cruise arrives at the harbor by noon. The driver will pick you up and then transfer back Hanoi. Check in hotel and free time. Today you will catch morning flight to Luang Prabang. Upon arrival, pick up and then transfer to the centre for half day city tour. Luang Prabang was the royal capital of the former Lane Xang Kingdom, with its gleaming temple roofs, colonial architecture and stunning mountain backdrop retains a unique charm rarely found in all Asia. Here is plenty to see, some of which are the impressive stupa of Wat Visoun, the shrine of Wat Aham and Wat Mai with five tiered roofs. You include these sights in a half day guided tour, which ends with a climb to Phousi Hill to enjoy a beautiful sunset view of the city and its glowing reflection on the Mekong River. There are 329 steps leading you on zigzag way past various temples to the sacred, gilded stupa of Wat Phousi at the summit. After breakfast, you will catch flight to Siem Reap. Upon arrival in Siem Reap you will be transferred by our local guide to hotel for check in. Siem Reap orientation, walking along the Siem Reap Riverside, and visit the fruit-bat in front of the Residence of King, late afternoon we drive to visit the biggest religious temple in the world - the magnificent Angkor Wat. Built by Suryavarman II in the early 12th century, Angkor Wat is considered a masterpiece of Khmer architecture. Then visit to floating village and take an excursion in a traditional wooden boat on the Tonle Sap Lake, the "Great Lake" of Cambodia, one of the largest in Asia. Sunset on the foot of Phnom Krom Mountain. Early morning, you enjoy the Tuk Tuk to the jungle-covered temple of Ta Phrom and come back to hotel for breakfast at 07:30. One hour later, begin your temple exploration today at Angkor Thom City by west gate. From the enigmatic faces of Bayon temple to the intricate bas reliefs of the Terrace of the Elephants, Angkor Thom is filled with fabulous monuments. Lunch will be provided in the house of villager. After lunch you drive to Banteay Srei, it is also one of the most beautiful. Built in 967 AD by Jayavarman V's guru, it showcases the most exquisite, deep and complex carvings in all Khmer architecture. Free in your own until your departure time. Driver will transfer you to the airport for your departure flight. 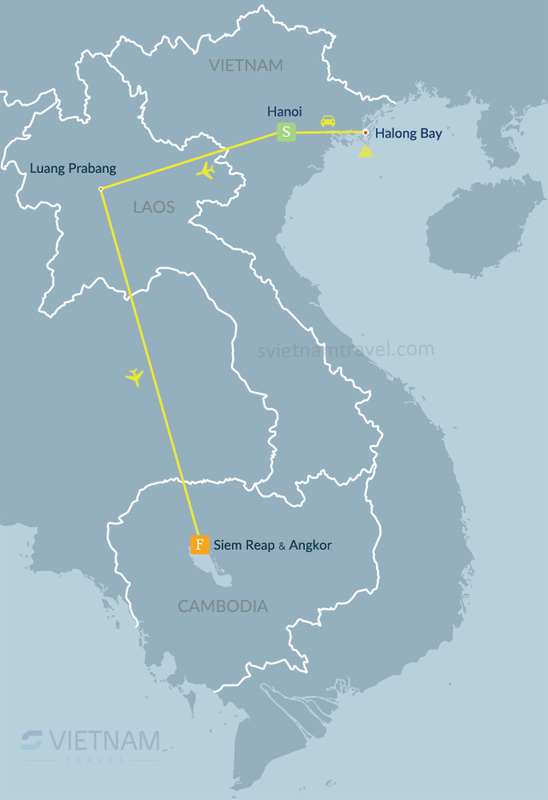 Flight tickets Hanoi - Luang Prabang, Luang Prabang - Siem Reap.